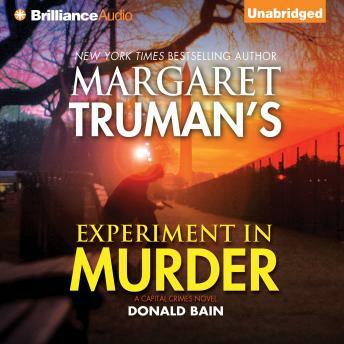 Margaret Truman thrills again with Experiment in Murder, a riveting installment in the Capital Crimes series! A Washington psychiatrist is killed in a hit-and-run on the street in front of his office. Suspicion quickly focuses on one of the doctor’s patients, and Mackenzie Smith is called in to defend her. Then information emerges that links the slain shrink to a highly secret CIA mind-control project. A young man, the perfect mind control subject, is programmed to assassinate the front-runner in the U.S. presidential race. As he zeroes in on his target, other government agencies become aware of the rogue CIA program. Mac's client, the accused killer, seems to be the key to infiltrating the project—she's become the perfect spy. But the assassin is programmed to kill anyone who threatens him or his organization—even Mac and his wife, Annabel.